A Pearland, Texas plumbing emergency stops your daily routine or special event. You just want to get back to your life. The trained professionals at Bay Area AC, Heating and Plumbing at (832) 623-8889 will quickly assess your issue and give you a guaranteed price for repairs before any work is begun. Then we do the work fast and efficiently. Plumbing problems frequently can be easily and quickly fixed. Our focus is to do the best most efficient job for you, removing this interruption from your day. We build relationships with our customers so that we are their first call for their next plumbing problem. Tough plumbing problems are our specialty. We show you your options so that you can decide what fits your situation and budget. Then we repair or replace the items involved. Our goal is to get you back to your life as soon as possible. Our licensed, bonded and insured technicians will take care of any plumbing catastrophe. We have all the tools and capabilities to get it done right the first time. You always know the price before we begin, and we guarantee all work. This has kept our customers happy for years, and servicing repeat customers is our lifeblood. 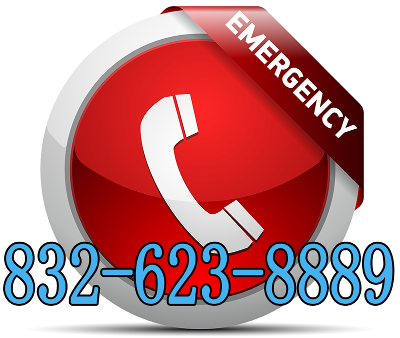 We look forward to helping you out of your emergency. We are equipped to work on any kind of pipe, from cast iron to PEX. We can make any repairs or adjustments required by the codes where you live or work.